There's a very special camp right here in Ohio, about 45 minutes from Columbus, for children with serious illnesses. Flying Horse Farms, a non-profit organization, maintains a 200 acre spread in Mt. Gilead, Ohio, with all the regular camping accouterments like a lake, swimming pools and outdoor amphitheaters. But it also has camp counselors of the four-legged variety. 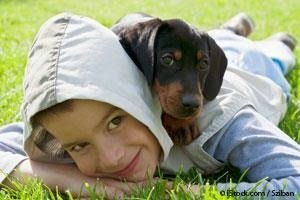 According to this article on Dr. Karen Becker's blog (she's one of our favorite holistic veterinarians), "The canine counselors play two roles with the children. One of their jobs is to allow the kids to work with them, running them through agility courses and teaching them tricks. The dogs also visit various activities throughout the day to give the campers an opportunity to play and laugh and connect with them." And the benefits provided to these children (and no doubt to the dogs as well—what dog wouldn't want to run around a camp all day playing with kids! ), are many: The canine counselors reduce the childrens' anxiety while upping their confidence, provide quiet companionship when necessary and "raise the camp's overall happiness quotient." The camp's motto is "For a week at a time, being sick takes a back seat to being a kid." Hooray for Flying Horse Farms and all of their camp counselors (especially the pups!). How brilliant. Have a terrific Tuesday and happy St Patrick's Day.. Happy St. Paddy's Day to you !!! And a Happy St. Patty's Day to you both! Parental Unit is baking Irish soda bread today!